The Starchild Skull: Is it a space alien? EDITOR'S NOTE: As of March 2010 the Starchild Skull has had new and more elaborate DNA tests which appear to prove that it is a hybrid (human-unknown). For details please see the end of this article. There's so much junk on the web. You don't know what is real or hype. When I first saw photographs of the oddly shaped "Starchild skull" I thought there could be only two possibilities. It was either a skull from a deformed baby (since no adult could survive with such a distorted head) or it was an unfamiliar animal. Of course, with a name like "Starchild" I immediately thought of the round headed, narrow jawed images of so-called "Grey Aliens" -- made famous by Whitley Streiber's book cover [right] on Communion. But that was a distant third possibility for sure. 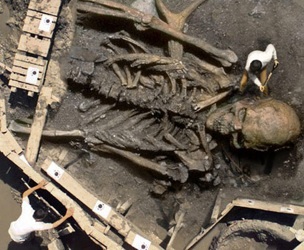 I figured that time, the scrutiny by anthropologists and advances in science would debunk this bit of "web legend", much like the giant skeletons that were created in Photoshop [below, right] and touted by the Pravda News Service (Russia) as "real". Recent science has made analysis of DNA from ancient bone fragments a possibility and the initial results for this highly unusual skull have forced that third possibility -- that it is extraterrestrial -- to the front. Of course, life is never simple. The analysis didn't show that the Starchild skull was a space alien since the study of DNA is done by comparing new samples with old samples of genetic material. We don't have any alien DNA of file. Instead, the results revealed that the Starchild had a distinctly human mother but a non-human father. In short, it was what scientists call a hybrid. We'll get to the complex science and a detailed analysis of the Starchild skull, but first lets get some obvious facts established. More recent hybrid revelations are detailed in Zecharia Sitchin's books, based on his translations of Sumerian scripts like the Atra Hasis and the Ennuma Elish, in which the ancient people describe how modern humans were created by mixing the genes of the "Gods" and primitive human ancestors to create a race of intelligent ancient workers. These "gods" were called the Anninuki and they allegedly came from another planet called Nibiru. Call it science fiction but this story is over 6000 years old! While the Starchild skull is only 900 years old, its piculiarities suggest some ongoing interaction between our human race and an unknown species. The Starchild skull was found 80 years ago in a remote cave in Mexico. 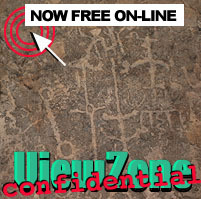 A teenage American girl from El Paso was visiting her family in the Copper Canyon region, about 100 miles south of Chihuahua, and discovered the remains of two individuals lying on their back, covered by just a few inches of dirt. One of the skeletons was small, like that of a child, and had a oddly shaped skull. Because of the local customs concerning respect (and fear) for the dead, the young girl was afraid to tell the villagers about her discovery. She hid the two sets of skeletons in an ravine while she made plans to take them back to El Paso and donate them to her school for study. Before she could move them, a torrential rain flooded the ravine and washed the bones away. Two days later she found the skulls and some of the other bones but they had been damaged and broken by tumbling in the flash flood along with the mud and stones. The oddly shaped skull had lost its lower jaw completely [above] and half of the upper jaw was missing. The other skull had lost only its lower jaw bone. The girl managed to sneak both skulls back to her home in El Paso and kept them for the duration of her life as souvenirs of her visit to Mexico. She had given no special significance to the oddly shaped skull, thinking it was a natural deformity of some kind. In the 1990s, when the girl passed away, the skulls came into the possession of Ray and Melanie Young, also from El Paso. Coincidentally, Melanie had been a neonatal nurse and was familiar with many natural deformities. She quickly recognized that both the number and type of anomalies appearing on the deformed skull were not the result of any known pathological condition. The Youngs sought expert help with an analysis of the skulls and were referred to Lloyd Pye, who had the means and contacts to perform various tests on these two artifacts. Lloyd first arranged for both skulls to be x-rayed. This revealed that the portion of the upper jaw of the deformed skull had several impacted teeth (showing up at the 5 dark globs in the x-ray image [above right] and suggested that the skull belonged to an individual who died at about 5 or 6 years old. The next obvious anomoly was the frontal sinus regions. The human skull [abov: left and center] showed typical frontal sinuses between the eye sockets. The deformed skull had no trace of frontal sinuses, not even vestigial bumps indicating where its sinuses might have attempted to grow. This is considered extremely unusual. Considered vital for screening dust and particles from reaching the lungs, only about 5% of humans are born without frontal sinuses. Meanwhile, the second skull was shown to have been from an adult woman and exhibited the classic flat shape of "cradle-boarding." This ancient practice consisted of binding an infant's head against a board so that the shape of the skull would be elongated. It is still practiced in some African and Sourh American cultures and is thought to make the child appear more like deity. Whether "natural" or artificially shaped, the royal family of Egypt, who were considered deities, exhibited the same elongated heads as far back as the second millennium BCE. Pictured here [below A]is Nefertiti, wife of the Egyptian Pharaoh Amenhotep IV (later Akhenaten), and mother-in-law of the Pharaoh Tutankhamun. 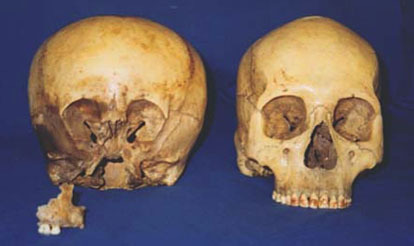 Many fine examples of artificially deformed, "bound" [bottom, B] or "boarded" [bottom, C] skulls have been recovered from Mexico and Peru. So, was the Starchild cradle boarded? Both skulls have been carbon-14 dated to 900 BCE. This was an era during which cradle-boarding was apparently in vogue for Central and South American Indians. Since both individuals in the cave were contemporaries, it might well be assumed that the Starchild's deformities were from this same practice. However, upon examining the skulls we note that there are some problems with this theory. Usually an infant was bound by string or fabric to a board with the head facing forward, the angle of sight horizontal and the neck slightly hyper-flexed (raised) to make breathing easy and unobstructed. We see this in the position of the flat area of the human skull [below, left]. But if we rotate the Starchild's skull to align with the flat area of the skull we see that the eyes look down and, more importantly, the neck is tilted in such a way that the airway would be blocked. Although there does appear to be a somewhat flat surface at the rear of the Starchild's skull, a close examination reveals it to be natural with many undulating features not normally seen in a cradle boarded skull. The brain capacity of Starchild is estimated to be 1600 cubic centemeters -- a good 200 cm more than a human. So was Starchild more intelligent? Next - the surprising DNA analysis! 2012: Doomsday Facts Dan Eden investigates the hard science behind the real doomsday events. The Last Doomsday A scientific look at the last human extinction event 14500 years ago. Will it happen again? A special message from Dan Eden.